There are many moving parts in a business, but sometimes, the biggest headache is the physical inventory. Whatever your type of business, growing it inevitably means you’ll pick up items along the way, perhaps faster than your offices expand. If you have a business pain point, imagine how it could be alleviated in the cheapest, most effective way. Maybe you’re looking to renovate the office but can’t simply throw out the expensive furniture you currently own. Maybe you need to store tax documents for the mandated period but are simply running out of filing space to do so. A temporary storage unit gives you possibilities. By getting creative, you’ll solve your business problem and perhaps save hundreds of dollars. Storage units are a tool, not a crutch. Don’t use them to store everything you don’t see a future use for but don’t want to bite the bullet and get rid of. Don’t use them to store your documents while failing to modernize your company, adopting a more digital work interface. You won’t save much money if your storage unit isn’t serving an active purpose other than holding things you don’t even need. Businesses that involve receiving and shipping goods can gain a lot by renting a self-storage unit. Usually, the cost of a storage unit is far less than that of a garage downtown. If you coordinate with shippers to operate out of your storage space, you don’t even have to be there every day. You’ll save a ton of time and money on your commute, and the shippers you work with will be pleased to do their job from a professional, modern facility. 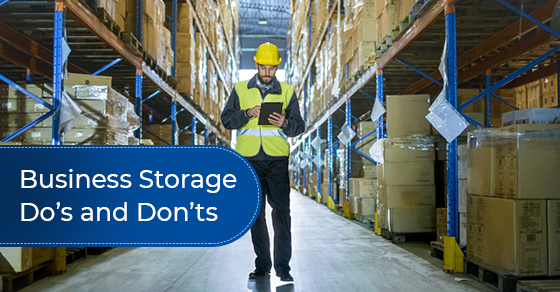 Make sure you’re visiting your storage space frequently, especially if different people are going in and out for deliveries. It’s up to you to monitor this extension of your business to ensure that nothing is being taken, messes are cleaned up, and items are leaving and arriving in good condition. All business, especially small businesses, are very concerned with how much they’re spending on rent for their office space. If your business needs to shave some costs, consider a self-storage unit for your workspace. The price for square footage really can’t be beaten, and the facility is regularly maintained. You also have the bonus of tight security, which most offices sorely lack. Choose a location that’s actually convenient for your staff. If they have to travel well over an hour to work every day for the sake of you paying less rent, you soon won’t have to pay their salaries either. They’ll start looking for options closer to home, even if they like their jobs and the pay is competitive. Some storage units are in areas that could only be described as the boonies. This is fine if you’re planning to drop off your Aunt Mabel’s old sofa and don’t plan on returning for ten years, but it will seriously annoy your staff. Most entrepreneurs aren’t aware just how much they can write off as business expenses, and storage units are no exception. If they are a necessary business purchase, be sure to factor that into your year-end tax claim. Self-storage isn’t the first thing that comes to mind when thinking of business tools, but there’s no doubt they can be a lifesaver. If you need to store surplus items that won’t fit into your current office, want to optimize your shipping process, or are looking to save a substantial amount of money on rent, consider a storage unit. It’s simple but effective. You’ll wonder why you didn’t do it for your business sooner. If you’re looking for clean, secure, and affordable self-storage spaces, call Ultrastor at (289) 812-0153, or contact us here.